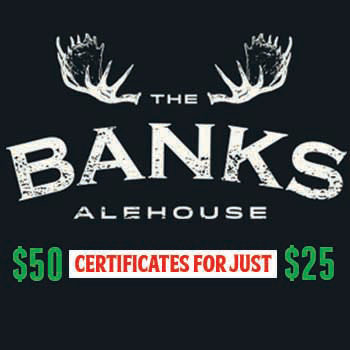 Get your $50 Banks Alehouse gift certificates for just $25 ~ Featured HPC Deal starts @ 8 AM on Thursday, February 22. Brews, Bites, Sports-and now great deals with this Half Price Club offering! Don’t forget to make your reservation for the Banks Sweetheart Dinner for two, featuring spring mix salad, with pecans, fresh raspberries, and gorgonzola cheese , . New York Strip steaks seasoned with the Banks' house steak seasoning and a loaded baked potato and Balsamic glazed brussel sprouts. And dessert: strawberry cheesecake topped with chocolate dipped strawberries. Just 80 dollars per couple-Make reservations now for 530, 730, and 9. Must be 21 or older, and only at the Banks Alehouse!